It is a rare outstanding forest with an innumerable number of over 100 year old trees. It is one of the last places where you can find free roaming wisent. And it is the very last primeval forest in Europe. Bialowieza is on the border of Poland and Belarus. So you can only be left speechless when you hear Jan Szyszko Poland’s environmental minister. He stated ”The Białowieża forest was granted UNESCO natural heritage status illegally. This ridiculous statement was made due to the fact that State Forest National Forest Holding started to log the precious ecosystem. This was done under the excuse of fighting a bark beetle infestation. In fact the conditions in the forest have changed. First in the 1950 a drainage system was established in order to enable agriculture in the area. Second, over the last years there were many dry summer periods. This lead to the lowering of the groundwater table and very vulnerable spruce trees. These trees are now under threat of a bark beetle outbreak. The answer of the government came in March 2016: Logging trees to get the outbreak under control. This action is for two reasons a farce. On the one hand many scientist stress that it is impossible to regulate the outbreak in this way. On the other hand the bark beetle out break and the deadwood it generates are part of the important ecological processes which happen in the last remaining primeval forest of Europe. This mismanagement is not the peak of the affair. The whole debate around the bark beetle is an excuse to hide the commercial interest of the logging actions. Besides over 100 year old infected and uninfected spruce trees oaks are felled as well. The campain to protect the forest was capable of tracking the way of the wood. http://save-bialowieza.net/decisions-regulations/ Here is a list of purchasers in polish. 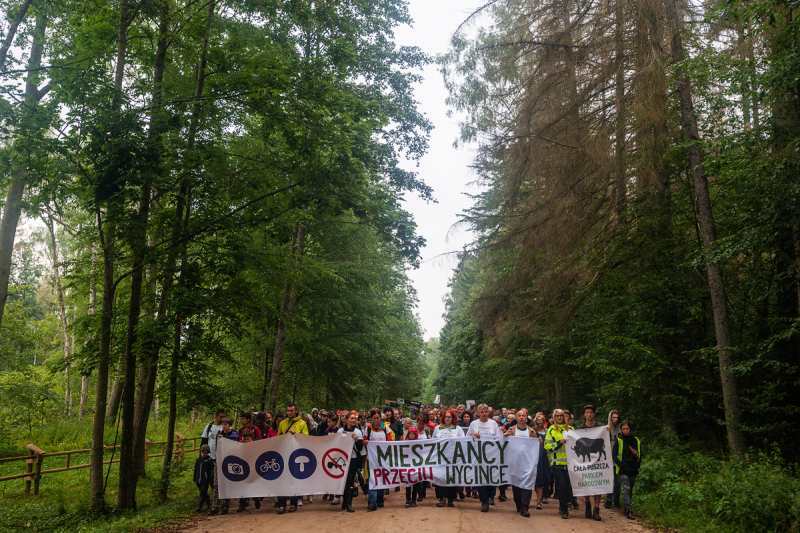 Due to the fact that Bialowieza is not only a national park at its part but also UNESCO world heritage and under European NATURA 2000 protection the whole logging is illegal. Poland violates world heritage and European law. The European court of justices gave the one of the strongest reaction it ever made and called Poland to stop logging immediately in July. Since the polish government refuses to stop the illegal exploitation huge resistance occurs. The UNESCO tries to save the area but also scientist and whole universities are writing letters to the polish government. All over Poland there were demonstrations to stop the logging of “dla puszczca”. In the heart of movement there is a protest camp directly in the region. High and strong spirited forest protectors gather there and continue organizing actions. Asia, one of the activists in the camp says: ”It is unbelievable that the polish government acts this way! We are very happy about the big support that we get. Not only on demonstrations and action all over Poland but also from activists which came from all over Europe during the summer”. In the camp a lot of activities are planned and executed. The activists are documenting the tree cuttings for the European court of justice but they also go for more direct actions. “Since there is an European decision it is perfectly legal what we are doing. Some has to stop this destruction therefore we sneak in the forest and chain ourselves to the machines so they can’t work” explains Asia. The activists are facing huge repressions during their actions. Forest guards try to hinder these actions brutally. They remove the eco warriors with brutal physical force from the scene of crime against forests. *Jan Carl Matysiak was previously working for GeaSphere South Africa and he attended the work of MEYN and the South AfriCan CCRI process. Currently he is a Student of Environmental Science and took part in the protest around the Bialowieza Forest.